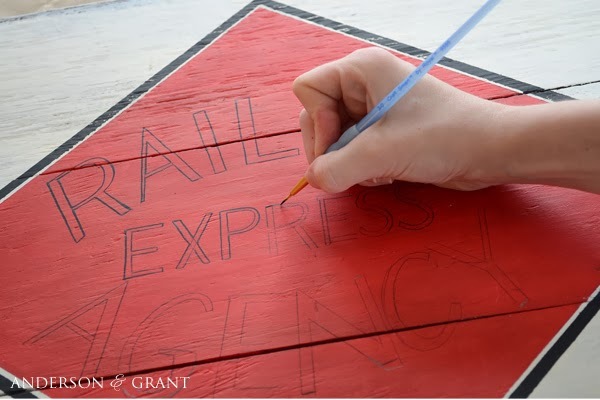 Hand painting a sign is a great way to add a unique piece of art to your walls. 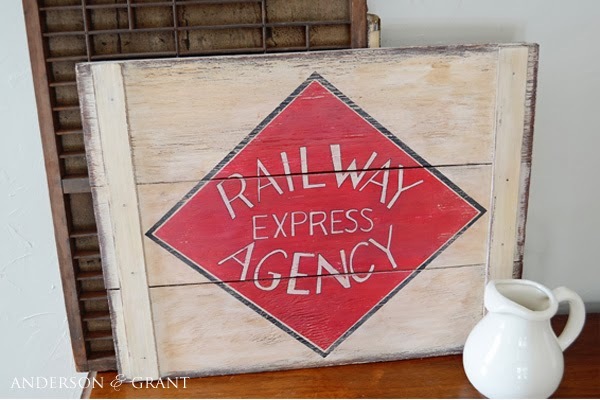 The best part about doing one that is distressed and worn-looking is that the sign and painting is hard to mess up. 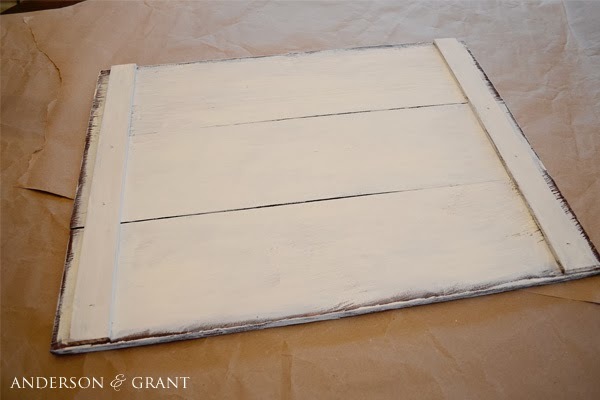 Even if you are not a great artist, the painting looks great once it is all sanded! 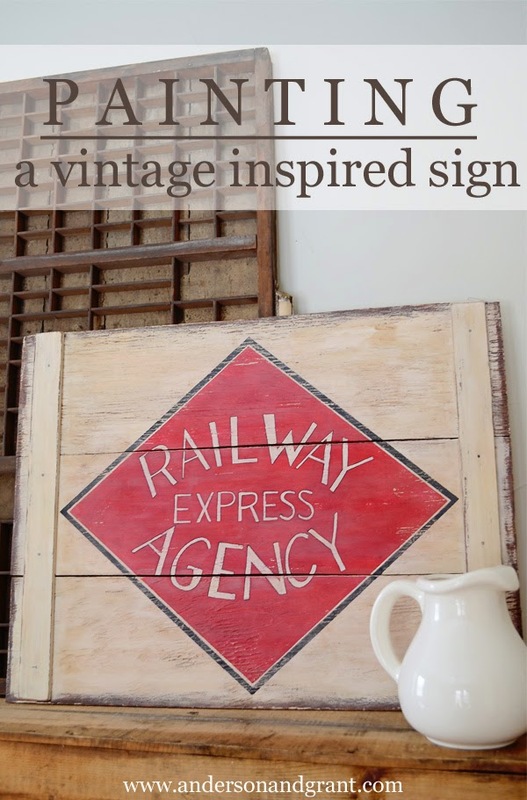 I decided to create a vintage-inspired sign, but wanted to do something a little different than the ones I've been seeing. Rather than create a generic GROCERY sign or another one inspired by someone else, I chose to recreate a sign that holds a little meaning. I love spending time researching my family history, so what better place to find inspiration for some art?!?! 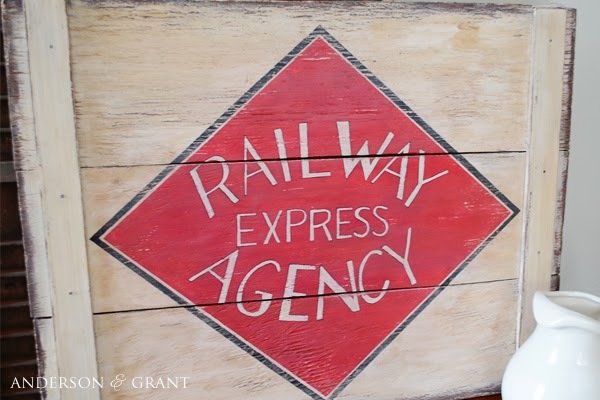 Many years ago, my grandfather worked for a company called Railway Express Agency....It was a company much like UPS and used both trains and trucks to deliver packages and goods. There are even stories of my dad as a young boy riding around with my grandfather in the delivery van....could you imagine that happening today? 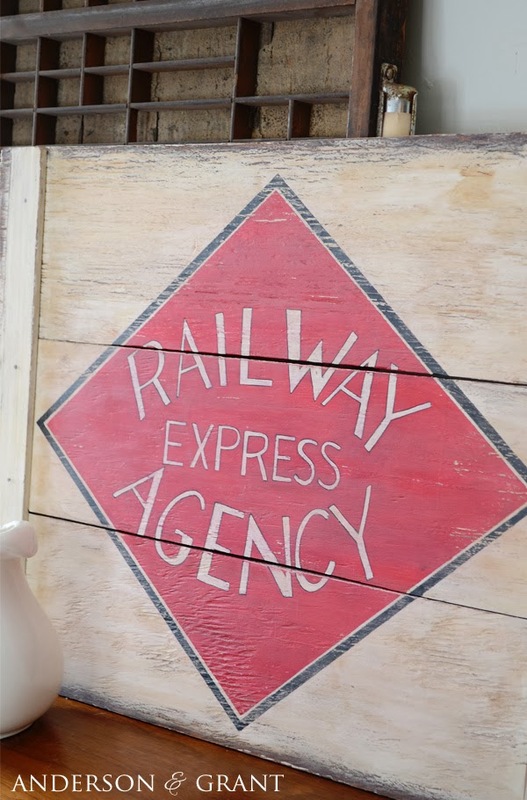 I decided the Railway Express logo would make the perfect vintage inspired sign to share with you. It's a unique idea and actually means something to me and my family history. 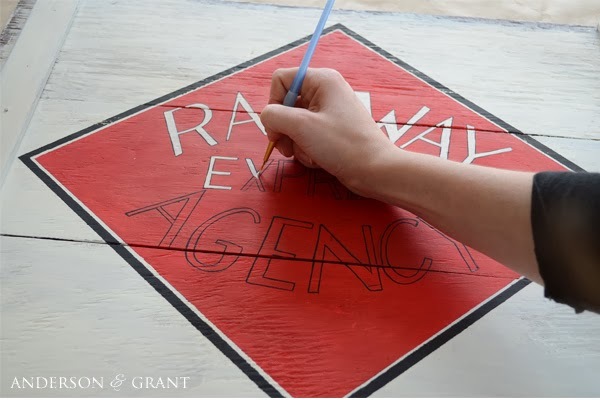 I began by tracing the diamond shape of the logo onto the board using carbon paper. 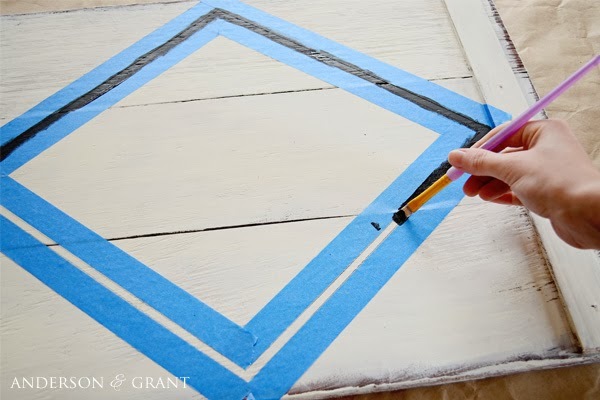 I applied painters tape around my lines to make painting a straight line easier. The outside border of my logo was painted black. After letting the paint dry slightly, I pulled the tape off. 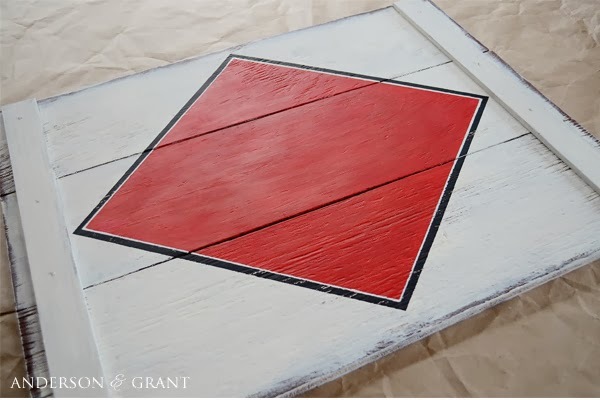 Then I added some more tape to paint my red diamond shape, leaving a small amount of the white showing in between. Pulling the tape off this time took a little of the black paint with it, but I was fine with that....it just added to the distressed look I was going for! After the red paint was dry, I used carbon paper again to trace on my letters. The letters were painted first with black over the trace line, and then filled in with white. This was easier than trying to add black highlights AFTER painting the letters. 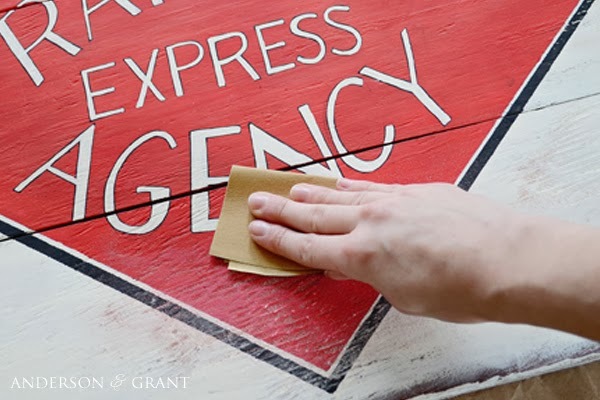 When everything was dry, I gave the sign a good sanding to distress it. I mixed a batch of strong instant coffee to use as stain. 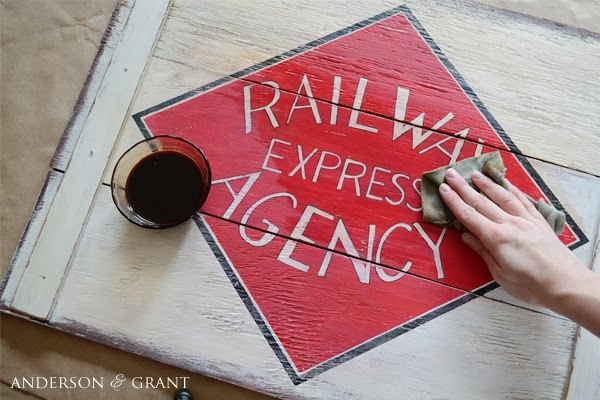 First I wiped the stain on and off using a rag, but didn't really get the dark color I was looking for....So I went back and brushed the coffee on and let it soak down into the wood. I'm loving how the coffee settled into the sign more in some areas than others. Don't you? And that's it! I need to add a few hooks to the back in order to hang the sign on the wall. But other than that, it is done! What do you think? 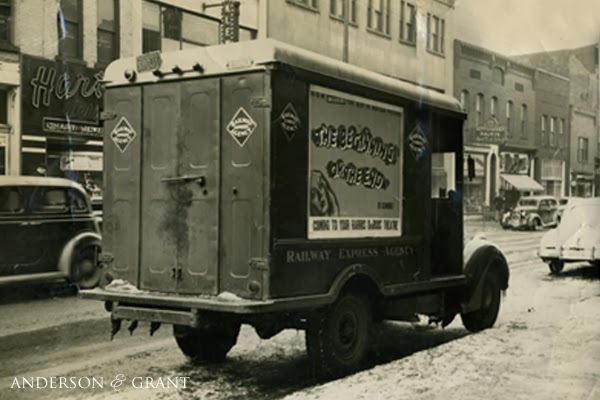 I have a few more sign ideas floating around in my head involving places where my ancestors lived and worked. I can't wait to share them with you! Do you have anything you can make that has some family history attached?